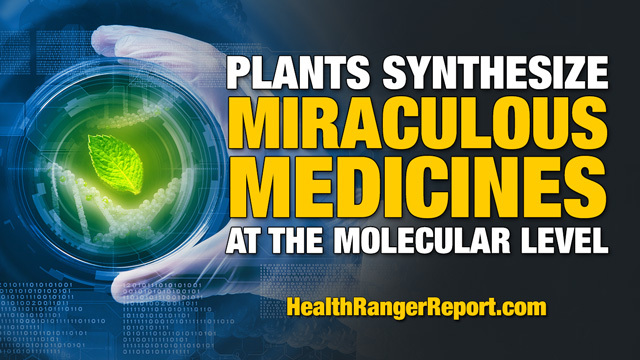 Corrupt governments and drug makers have long tried to convince you that only man can create “drugs” in artificial laboratories, but the simple truth is that plants have long been creating antibiotics, anti-diabetes nutrients, anti-cancer nutrients and a long list of other miraculous compounds that are safer and more affordable than toxic pharmaceuticals, says Natural News founder/editor Mike Adams, the Health Ranger, in a recent podcast at HealthRangerReport.com. After explaining how solvents are used to dissolve certain chemicals in food samples during laboratory testing and that different solvents can extract different chemical constituents, Adams said that plants actually are capable of manufacturing their own “miraculous” medicines during the process. Those molecules take on a self-defense kind of role, protecting the plant from disease and other vectors while also providing it with nutrients. And in these ways, they can also be useful to humans, he says. Plants, and especially their root systems, must be anti-bacterial as well because otherwise they would be destroyed by bacteria that are present in the soil. “Every plant that survives, or virtually every plant, creates its own antibiotics,” said Adams. “Have you ever thought about that? That makes every plant and tree a “pharmaceutical manufacturer,” he added. The most powerful food and medicine on the planet is free, and it’s growing right outside your door and around your neighborhood. Did you know that wild local plants and foods are far better for you than organic produce from a supermarket? They’re naturally loaded with plant-based medicines — phytonutrients — and you’d be surprised how many are growing near your home right this very minute. In fact, no matter where you live, there are an astounding number of wild plants in your region that have been used for thousands of years as FREE food and medicine. He went on to note that average persons do not have this kind of knowledge, and therefore are oblivious to the healing properties of plants. Most think food only comes from plastic containers and that medicine must only be doled out by Big Pharma and traditional medical doctors. Later, he reiterated what he had written in 2011, noting that there are likely plants and weeds growing in your backyard that may contain cures for chronic diseases, like diabetes and cancer, or some that could prevent heart disease, reverse Alzheimer’s, or treat other conditions. And, said Adams, when you account for plant life growing in all the different regions of the planet, there is a veritable unlimited source of ‘medicines’ that are simply waiting to be utilized. “Some of them have different properties, but they all have in common the idea they can help prevent disease, accelerate your healing, and keep you healthy,” said Adams. The Health Ranger invites you to stay further informed at Medicine.news, NaturalNews.com, and Fresh.news. Meanwhile, listen to his entire podcast here or click below.